Bill Sherwood’s New York‒set Parting Glances is chiefly remembered as the first movie of any consequence to tackle the AIDS crisis. True enough, but the tone of the movie couldn’t be further from Longtime Companion, Philadelphia, or the many other earnest AIDS pictures that followed. It is, more than anything, a party movie, with a sprawling cast of characters, a fresh scene to explore, some classic Bronski Beat tunes, and an infectious eagerness to fit as much life as it can into its 24-hour time frame. Accordingly, it feels like the first major gay movie made for gay people. At the picture’s center is a twentysomething couple: Michael (Richard Ganoung), a frustrated writer-editor, and Robert (John Bolger), who works a cushy, globe-trotting job with the World Health Organization in famine relief. It’s Robert’s last night in town before leaving for an indefinite stretch in Africa, and Michael doesn’t want him to go. Michael also can’t help but wonder if Robert is using a faraway health crisis to escape the one closer to home. 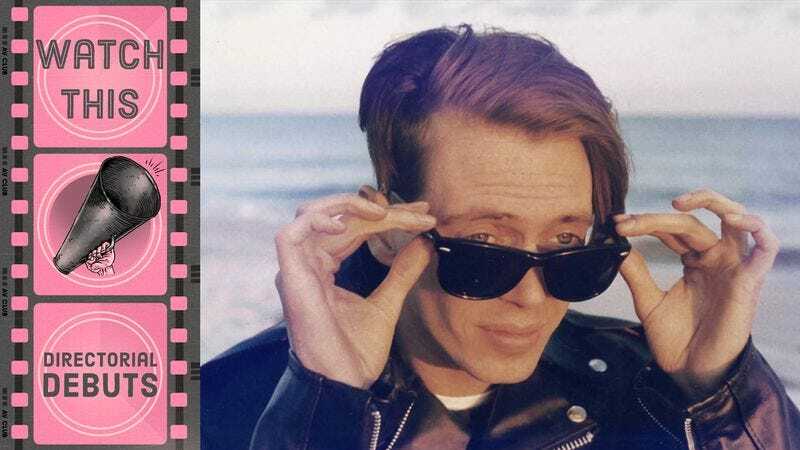 Though both men are disease-free, Michael’s ex, the punk musician Nick (a startlingly cute 27-year-old Steve Buscemi, in his debut), has recently been diagnosed with HIV, and Michael has been spending more and more of his time caring for him. All of this is established in the opening minutes, and it’s largely just a frame to explore the New York gay scene at a pivotal point in its history. A solid half of the movie takes place at Robert’s going-away party, and the casual, buoyant vignettes that make up this sequence provide a lovely snapshot of a community coming into its own. The gay types here run the gamut, but one of the surprises of the movie is that all of the characters—without any big point being made of it—gradually reveal unexpected sides of themselves, often with just a throwaway line or two. Initially, the amateur qualities of Parting Glances (it was Sherwood’s first and only film, and it cost less than $100,000) may register as a liability: The dialogue can be arch (especially at the outset), the acting can be actor-y. But as the movie goes on, liability becomes virtue. Not to get all rose-tinted-glasses, but indie movies back then had a roughness they just don’t possess now, and that very roughness could let in all sorts of fresh, genuine moments—moments that couldn’t have happened otherwise. The scene in which Michael tells Nick that he’s still his greatest love is, in its very plainness, more moving than the entirety of most “prestige” pictures. Sherwood died of AIDS-related complications in 1990 before he could make another film, and Parting Glances feels like his attempt to communicate the joy of life as fully and as deeply as he could before leaving. That said, he never shortchanges melancholy—it’s there throughout, shading everything. That’s the thing about party movies: All the best ones include melancholy. They have to, because the party inevitably ends. Availability: Parting Glances is available on DVD from Netflix or possibly your local video store/library. It can also be rented digitally through Amazon Instant Video and Fandor.